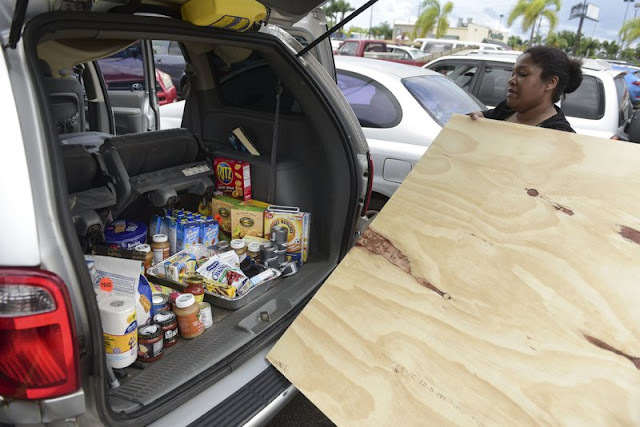 After loading the back of her vehicle with food Maria Minier loads a recently purchased wood panel to be used in preparation for Hurricane Irma, in Carolina, Puerto Rico, Tuesday, Sept. 5, 2017. ST. JOHN’S, Antigua — The most powerful Atlantic Ocean hurricane in recorded history has made its first landfall in the islands of the northeast Caribbean. The National Weather Service said the eye of Hurricane Irma passed over Barbuda around 1:47 a.m. Residents said over local radio that phone lines went down as the eye passed. The National Hurricane Center said Irma was maintaining Category 5 strength with sustained winds near 185 mph (295 kmh) and heading west-northwest on a path toward Puerto Rico, the Dominican Republic, Haiti and Cuba before possibly heading for Florida over the weekend.